MESSE BASEL, SWITZERLAND, MARCH 22, 2018 – Casio America, Inc. is proud to announce the latest addition to the EDIFICE line of timepieces; the ECB800. This high-performance motorsports-inspired watch combines the latest tech with a sleek design to give consumers a high-quality timepiece. The ECB800 provides racing enthusiasts extensive lap time features and a large LCD screen, which will be available in September. 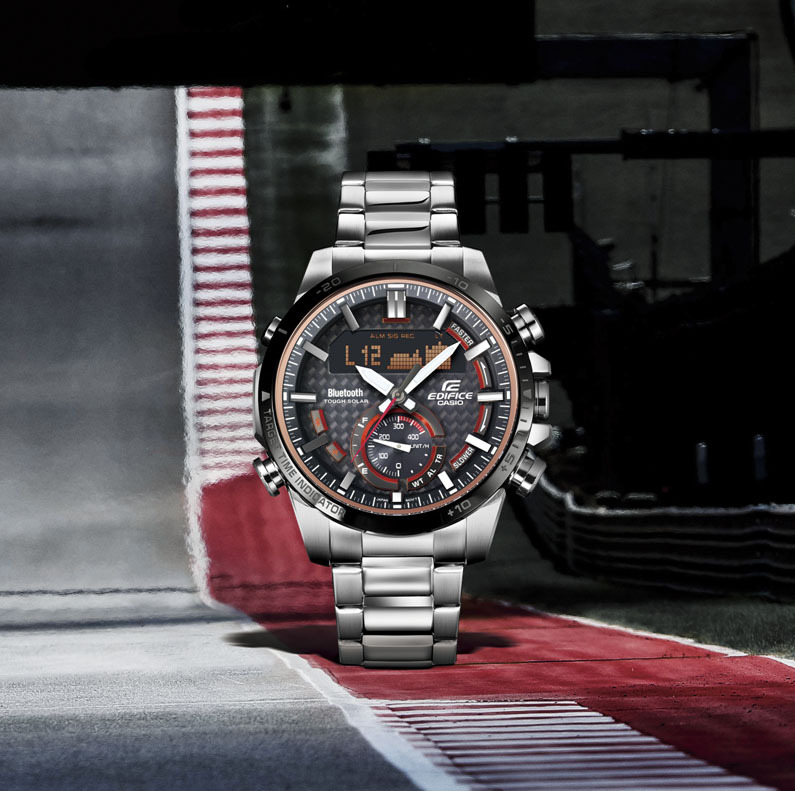 “The EDIFICE line of timepieces is known for capturing the essence of motorsports with precision, sleek design and innovative features," said David Johnson, Vice President of Casio’s Timepiece Division. “The new ECB800 not only continues this tradition but, takes it to the next level with enhanced technology and even more features geared for race fans." The ECB800 offers extensive lap time features including the ability to set a target lap time, which triggers a 30-second countdown to the target time on each lap. This feature affords race fans the ability to predict when the cars will come back around the track and gauge how fast they are going. Lap times are recorded down to 1/1000th of a second, with a 200-lap memory and the ECB800 includes an inset dial that displays the average speed, making it valuable not only for racing teams operating on precise timing but also for spectators who want more realistic insights into each race. The ECB800 is connected via the dedicated EDIFICE Connected Smartphone app and Casio’s Smartphone Link capability, which means that this timepiece will automatically pair with the wearer’s smartphone by pressing a dedicated Bluetooth® connection button. This connectivity enables the Accurate Time System that adjusts the time as the consumer’s location changes. With Tough Solar Power, Accurate Time System, Phone Finder, and much more, the ECB800 is packed with technology, making it versatile, both on and off the track. Casio’s EDIFICE ECB800 will be available nationwide in September for an MSRP of $270 at select jewelry and watch retailers, as well as ShopCasio. For additional information on Casio’s EDIFICE collection of timepieces, please visit www.EDIFICE.Casio.com.